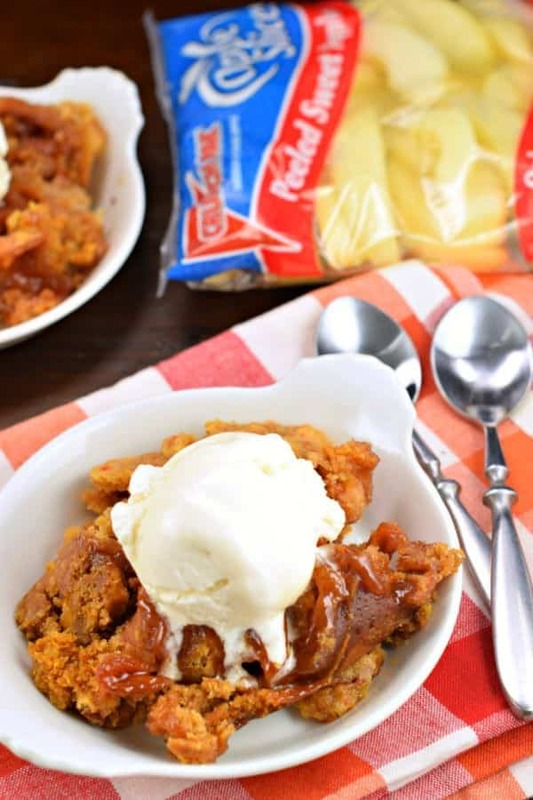 This Slow Cooker Apple Cake is as easy as tossing a few ingredients into your crockpot and letting it do it’s thing! 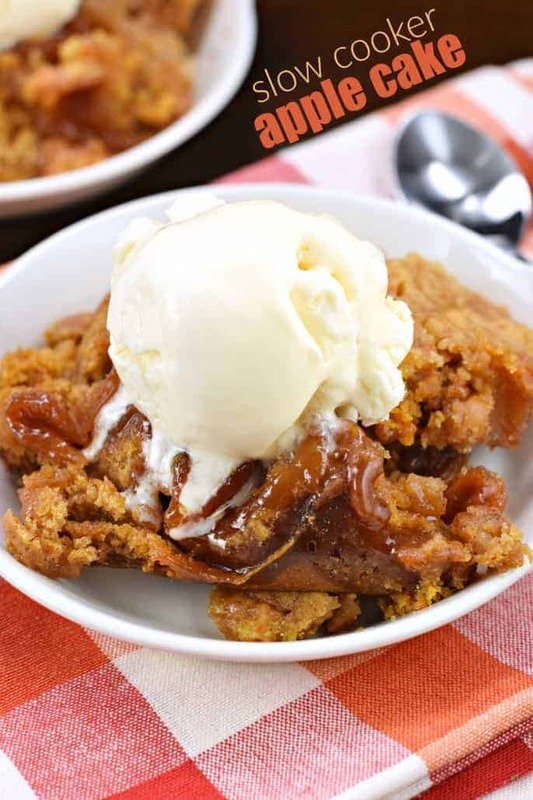 Top it with a big scoop of ice cream and serve warm! 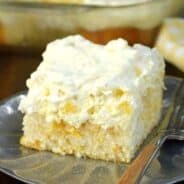 Up until now, I had never made a dessert in my slow cooker. Ever. And now suddenly, I want to slow cook ALL THE THINGS. Honestly, I had never seen the point. I mean, what’s the difference between putting your ingredients in a skillet or a cake pan vs. putting them in the slow cooker? Well. Really? There isn’t one. You can totally do that too. However, I love my crockpot. I use it all the time to make dinner, so why not occasionally come home to the sweet smell of apples and cinnamon? Plus, the apples caramelize into a gooey delicious layer on the bottom! This is going to come in handy in the summer when it’s too hot to run the oven, but I want to eat a delicious comforting dessert. I mean, we love Apple Pie in America, yet who wants to bake that on a hot summer day? Why not whip up one of these Slow Cooker Apple Cakes instead? And be sure to top it with a big scoop of ice cream too! Start with Crunch Pak sliced apples. It’s no surprise that I’m once again using myf avorite sliced apples in a recipe. I love the convenience of them, and my kids love putting them in their lunches too! Plus, you can get them not only sliced, but PEELED too! Perfect for today’s recipe! Layer your ingredients in the crockpot, the apples, brown sugar and cinnamon on the bottom. Then top it with a box of yellow cake mix. Pour your butter over the top…DO NOT STIR. Cover your crockpot and cook on low for 6 hours (or high for 2 1/2-3 hours). Do not open during the cook time, as this releases the necessary moisture to keep this cake moist and perfect. 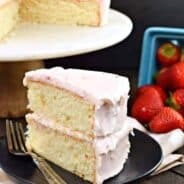 Serve the cake warm with a big scoop of ice cream or homemade whipped cream! 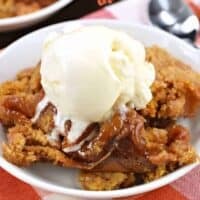 This Slow Cooker Apple Cake is as easy as tossing a few ingredients into your crockpot and letting it do it's thing! Top it with a big scoop of ice cream and serve warm! Lay sliced apple in bottom of crockpot. Add brown sugar and cinnamon and stir until apple are coated evenly. Sprinkle cake mix over the top of apples, spreading evenly. Pour melted butter over the top (DO NOT STIR). Cover the crockpot and cook on high for 2 1/2- 3 hours or low for 6 hours. Serve warm with a scoop of ice cream! This looks delicious, but the apples to cake ratio seems low. Can I make it with more apples? Wow! This recipe couldn’t be any easier. 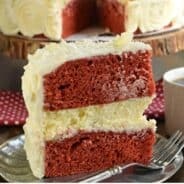 I’ve never made a dessert in my slow cooker. Can’t wait to get started! This sounds delicious — could you tell me what size slow cooker you used to make it? Thanks! I was always able to print your recipes……having trouble now. No longer is the “print” available. Please make this available. 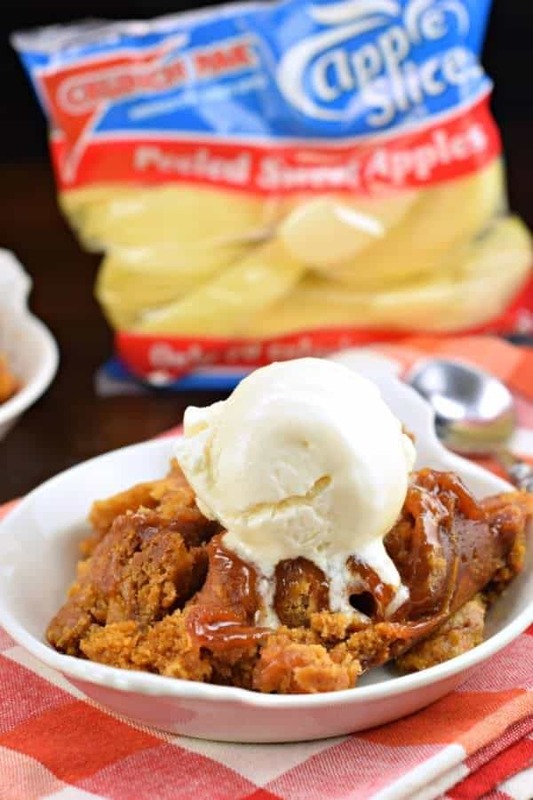 I really, really want to make the apple slow cooker recipe! Thank you. I bought a tiny 1l (2 pints) slow cooker to make overnight oats, but I’ve never used it. This recipe is perfect. If I substitute sweetener for the sugar, I may be able to justify eating it, lol. Well it’s now in the crock pot. Had everything in the house and was hungry for something sweet. Used two granny apples as we don’t have this brand in out store. I used apple pie spice liberally instead of just cinnamon. Couldn’t find the cinnamon and too lazy to look for it. Hoping it fabulous and I intend to have it with whipped creme as I don’t have any ice cream that isn’t flavored. I am also willing to prepare it fast and eat it. It looks really tasty. I will definitely try this one. This looks very tasty. However, mine turned out way too sweet. No one could finish theirs. I would definitely increase the apples ratio and pull back on some brown sugar… Maybe even add some stevia . I make cooked apples all the time with cinnamon, butter, and stevia instead of sugar. Everyone like it better. But depending on the brand you buy, start adding in small amounts. I love the ease of this receipe, so I’m going to try again and just tweak it a little for our taste. Thank you to shugarysweets for this great idea.